Fire up the grill and toss on these simple Greek grilled chicken wings marinated in lemon, garlic and thyme. A shareable and simple recipe. This recipe for Greek grilled chicken wings combines all of your favourite Greek flavours, like thyme and lemon, into a simple and delicious shareable meal. While these chicken wings do take a bit of hands-on time for flipping frequently, it’s 100% worth it. In my family, chicken wings are a big deal. They are kind of our thing, or at least one of them. 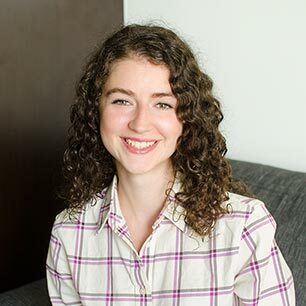 My dad and I go for chicken wings quite a few times a year (mostly in the summer, they lend themselves to a sunny patio) – it’s one of our favourite things to do together. On the other hand, my mom makes some of the best chicken wings, perfect for watching hockey games or just enjoying together at the table. They are a communal food, always served family style (the best way, right?) and whenever I whip up a batch of tandoori wings or wings with my signature spice blend and sauce, my family and I all gather around the kitchen table for a feast. We end up laughing and enjoying ourselves, eating with our fingers and having just one more (knowing that it’s never just one more). Sometimes, I’ll even put on a second batch and we’ll eagerly await the warm, straight-out-of-the-oven crispy skinned deliciousness. Just thinking about it makes me hungry and makes me yearn for those fun-filled evenings; we’re so lucky to enjoy each other’s company as much as we do. 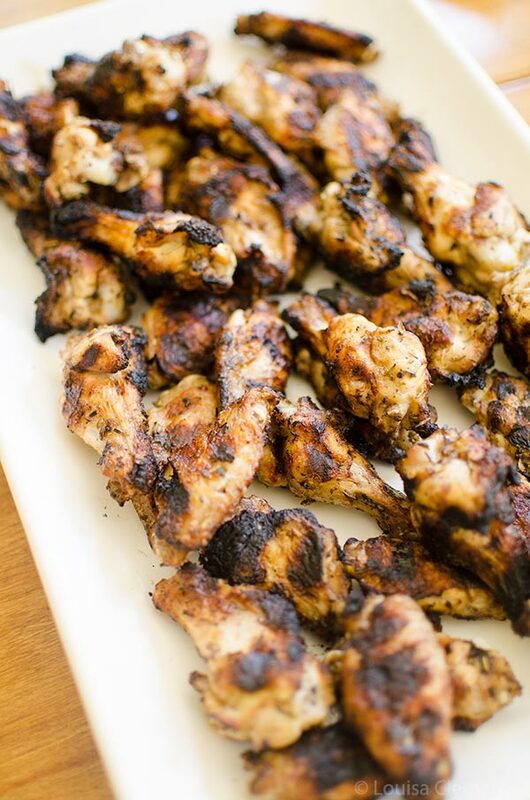 I highly recommend whipping up a batch of these Greek grilled chicken wings and seeing how it brings people together. I’ve been on a grilling kick this summer, and the next item on my list was chicken wings. Ever since I took my grilling class in February (where we grilled chicken wings), I’ve been feeling more confident with my barbecue and love experimenting with different ingredients. You see, more so than ever I’ve realized that I love the flavor of everything when it’s grilled. I knew the skin of the wings would be irresistible with the charring of the grill. And if you’re not a fan of a little charring on your food, well I hate to be the one to tell you, but you’re missing out on a world of flavour. 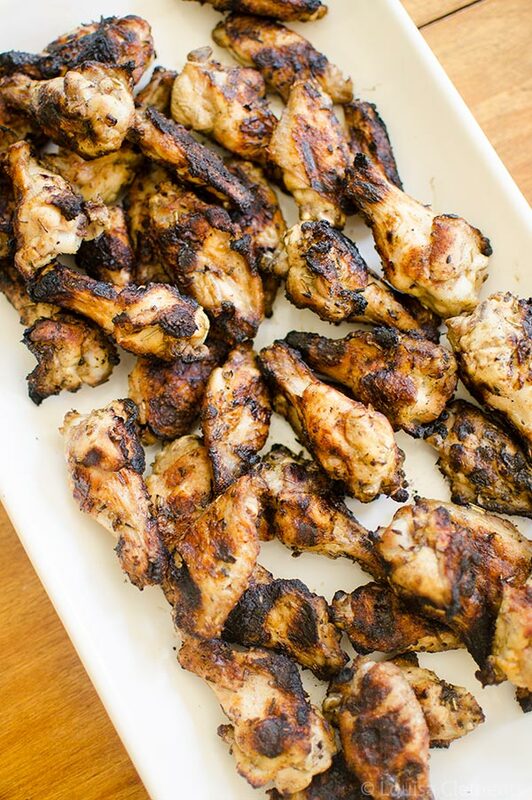 These Greek grilled chicken wings were inspired by; you guessed it, Greek cuisine. Last week I took you through Mediterranean cuisine, with an emphasis on the Italian side of things, but this week I’m using the basic flavours you’d find on your typical souvlaki or grilled chicken breast; lemon, thyme and garlic (and olive oil, there is always olive oil). 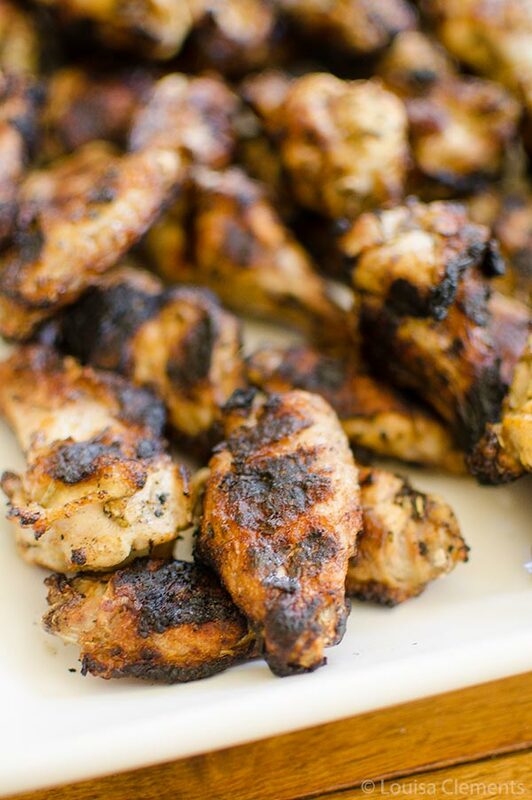 Over the years, I’ve perfected my Greek grilled chicken recipe and I wanted to change it up and knew that these Greek grilled chicken wings would be out-of-this-world good. Now you won’t find this on your typical taverna menu, but I think it should be and I think you will too once you give this recipe a try. You can also switch out the dried thyme for oregano in this recipe, which is something you’ll find is done often in Greek cuisine depending on what is available. In a large glass bowl, whisk together olive oil, lemon juice, herbs, garlic, salt and pepper. Add wings, tossing to coat. Cover and refrigerate for 20 minutes. Grill wings, covered, flipping frequently until cooked through, about 15 minutes.